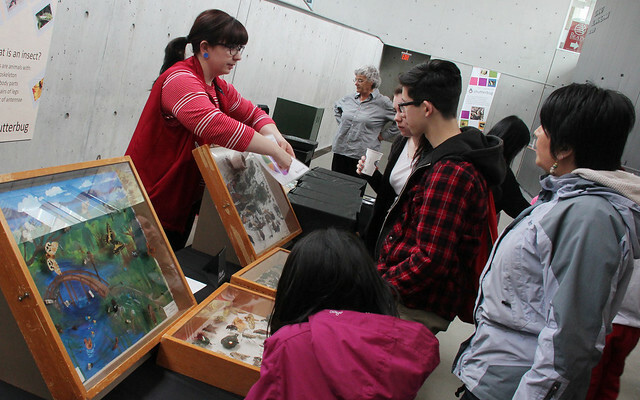 During Spring Break, join the Beaty Biodiversity Museum every day at 12:00 pm for a different hands-on activity, brought to you by volunteers, staff, curators, and special guests! Meet new friends while exploring different aspects of the biodiversity around us. 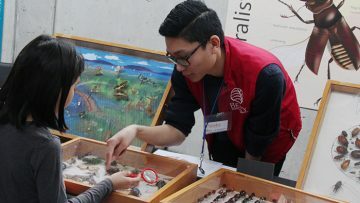 From identifying incredible insects, to art, games, crafts, and hands-on activities, you’ll be a biodiversity pro in no time. Meet under the whale at 12:00 pm unless otherwise noted. The Beaty Biodiversity Museum reserves the right to change or modify programming as needed. The Beaty Biodiversity Museum is closed on Mondays and statutory holidays. It is all about owls today! Learn about an owl’s diet by dissecting an owl pellet, touch different owl specimens, and make an owl craft to take home. Curious about DNA? Come learn all about the genetic code inside all living things. Participate in a DNA extraction and make a bracelet with your unique sequence. Get up close with some of the craftiest creatures in our Marine Invertebrate collection and create a take-home craft that mimics their camouflage abilities. Join our friends from the Pacific Museum of Earth to get hands on and learn more about the wonders of Planet Earth! After the activity, you are welcome to visit them by donation, just across Main Mall. If preserved well, plant specimens can last hundreds of years in a museum. But how is this done? Learn how to collect responsibly, press plants, and label them with Linda Jennings, the Herbarium’s Assistant Curator of Vascular Plants & Algae. This activity takes place in the Niche Café and outside – please dress accordingly! Today we will peer beneath the ocean’s surface and discover the fascinating creatures and formations that make up life under the sea. Find stations throughout the museum between 10:30 am – 1:00 pm!